We have been using symmetric keys for encryption/decryption on some SQL Server 2012 instances for a few years. 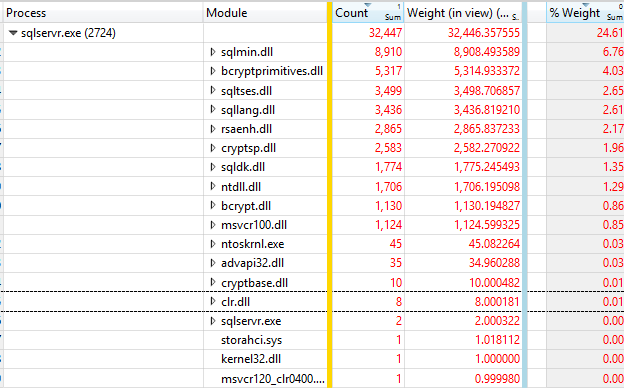 We recently installed some new instances of SQL Server 2014 and came across some performance issues decrypting the data on SQL Server 2014 installations. We have applied all available hotfixes, we've tried with different instances of both SQL Server 2012 and SQL Server 2014 with different setups like ssd disks, ram disks etc. We have tried the query locally on the SQL Server and remote. Execution plans and indexes are the same on all servers. This SELECT statement takes about 50 ms on any SQL Server 2012 server, including simple development machines. On any SQL Server 2014 server (including really powerful ones) the query takes at least 1500 ms.
Any suggestions on why the query is performing so bad on SQL Server 2014? What's changed? Edit: I just noticed that there is a KB article FIX: A query that uses the DECRYPTBYKEY function takes a long time in SQL Server 2014 but I have that installed and it doesn't appear to change the original conclusions below. Running the following code in both SQL Server 2012 (11.0.5343.0) and 2014 (RTM) on a quadcore (Intel Core i5-2320) X64 desktop machine running Windows 10. Two things become immediately apparent. A single thread is monopolizing the scheduler. Here the work is being performed by two threads (thread 3212 is running the idle task sqldk.dll!SOS_Scheduler::Idle). 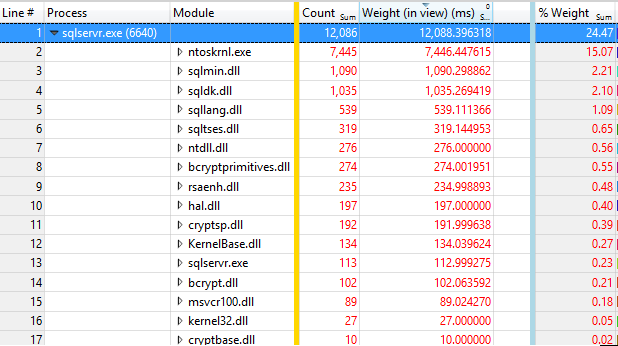 I'm not sure at the moment why the 2014 version reports 25% CPU in this view vs 30% in others but anyway it is readily apparent that time spent in ntoskrnl.exe has increased dramatically between versions and now 60% of time is spent in code in that module. Time spent performing the encryption has of course dropped correspondingly. 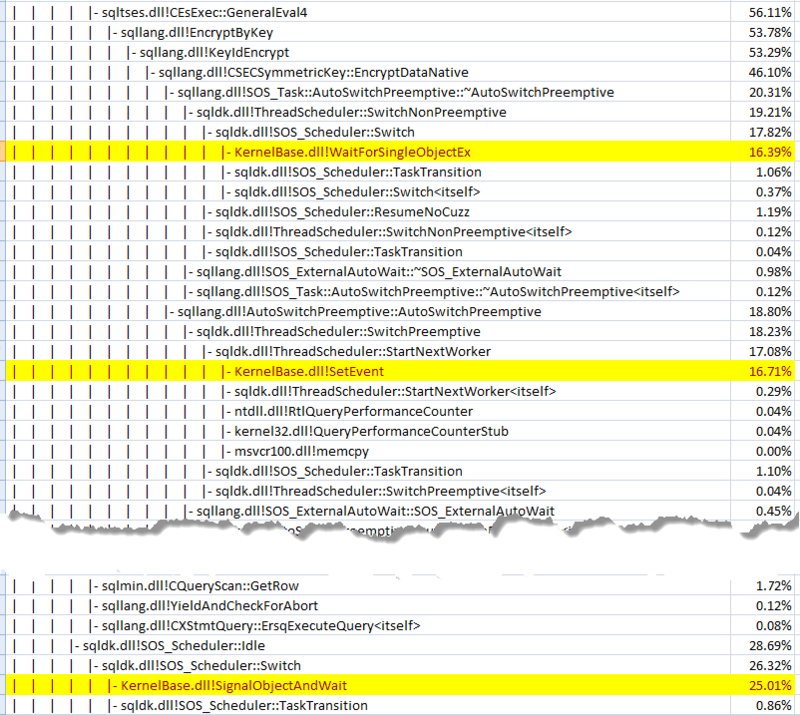 And attaching the VS code profiler the 2012 version looks like this and the 2014 like this. So it looks as though 2014 has additional logic to stop this hogging the scheduler and it gets switched off more frequently as highlighted by the additional items below. It can clearly be seen that whilst the PREEMPTIVE_OS_CRYPTOPS wait type does exist in 2012 it is not used in this case. Whereas for 2014 every invocation of the ENCRYPTBYKEY function encounters this wait type and in this case it (combined with the context switches) added 8.2 seconds to overall elapsed time. The call stacks for some of the more time consuming kernel calls are highlighted below. Timings here fell somewhere in between the 2012 performance and the 2014 non affinitised performance where the code executed across multiple different cores. Sql Server 2012 slower than 2005? How can I create a SQL Server 2012 database on SQL Server 2014?